Board members 1930s: Chairman Oswald J. Finney. Directors: Stephen Lagonica, Byron G. Dellaporta, Harold E. Finney, R.E. Williams, Henry Clark, Antoine Tréhaki, Eric Dukes. Head office: Rue Rolo, Alexandria. Having lived in Dokki for fourtysomething years, Mr. Khaled often heard the nearby Midan (traffic circle) referred to as "Midan Finney". So who was that Finney chap and why was an English name so closely connected to this tiny corner of the nation's capital? 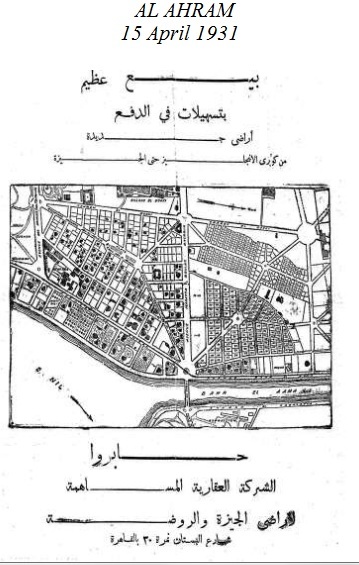 The fact of the matter is that not only was Midan Sad al-Aali originally Midan Finney, but a bisecting street by the same name existed before it too was subjected to a similar change. Sad al-Aali Street which intersects the entire neighborhood of western Dokki was for more than three decades known to everyone as Rue Finney. Also to be noted is that the Alexandria-born Mr. Finney, whenever in Cairo, lived in a large villa overlooking "his" Midan. Finney's house is still there today but in the corrupted guise of a hospital. 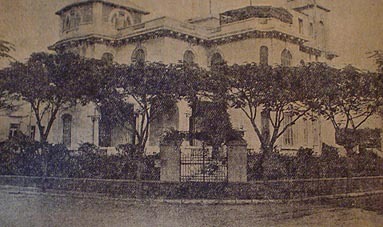 Acquired by Ahmed Hassan Pasha, Villa Finney was sold to the Chabrawichi family who turned it into a hospital thus making it the second such institution fronting the Midan. Anouss Hospital, specializing in ENT, had made its debut a few years earlier. (Anouss H. was pulled in 1997). Soon would also appear not far from Midan Finney the hospitals of Doctors Ali Ibrahim and Abdallah Kateb. 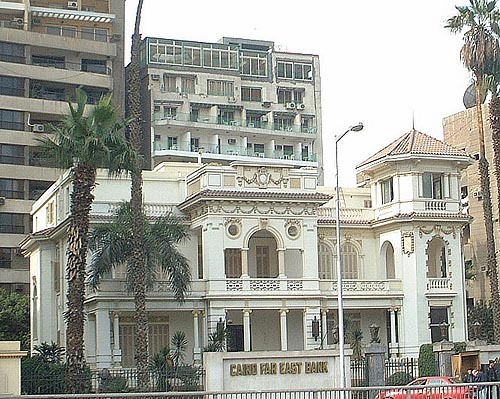 For some time during the 1950s this part of Cairo was characterized as an upmarket medical center for the rich and famous. 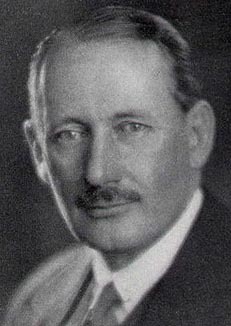 The Finneys (Oswald and his wife Josa) were among the leading British families of Alexandria. A major figure in the cotton trade its patriarch Oswald J. Finney was well known not only because some of the world's finest tapestries festooned the walls of his five-floor hotel particulier at No. 3 Rolo Street, but also for being the town's top publisher and reportedly one of its wealthiest men. Likewise, he sat on the board of several giant cotton trading companies in both Alexandria and Lancashire (UK). 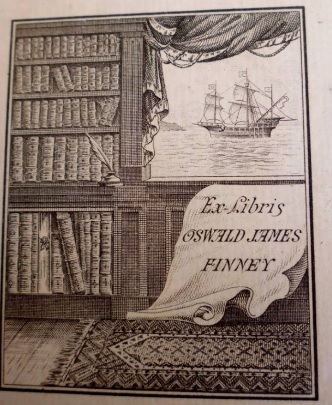 More importantly Finney was the sometime president of the Alexandria Commercial Company, the Alexandria Insurance Company, the Filature Nationale d'Egypte and the Minet al-Bassal Stock Exchange. 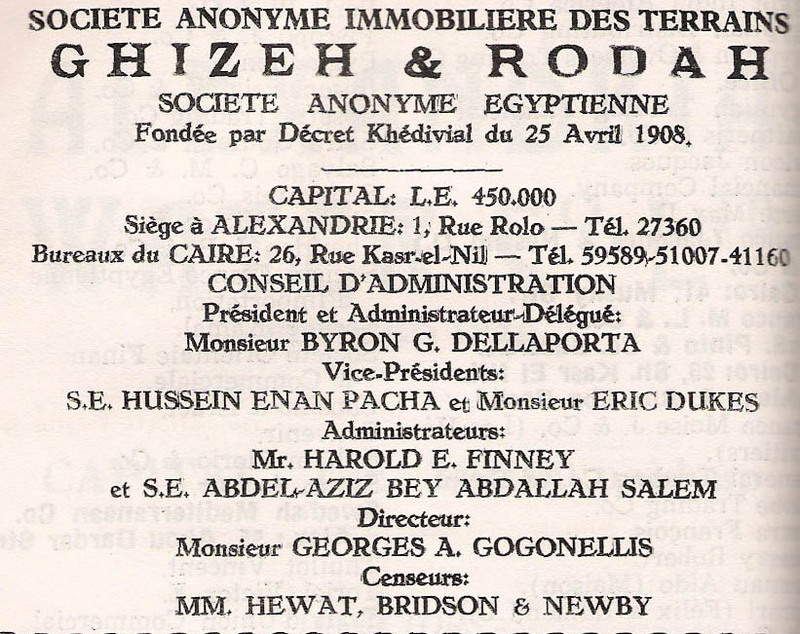 Yet as far as the nation's capital is concerned we learn that Oswald Finney was also president of the Société Anonyme Immobiliere des Terrains de Giza & Rodah. 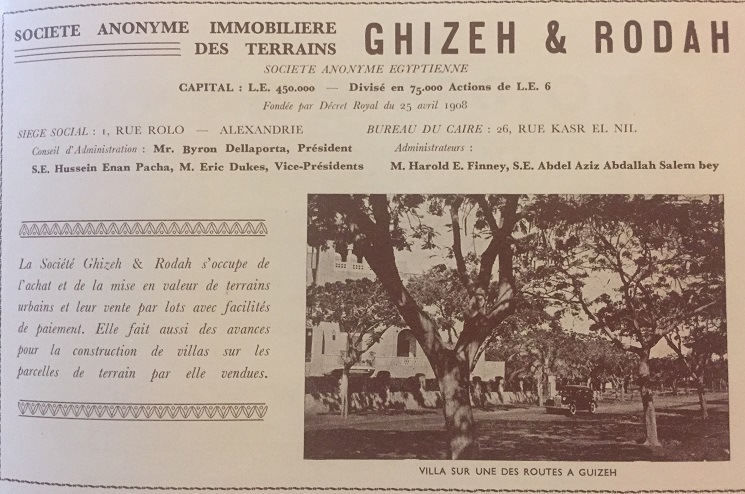 That is to say he headed the real estate development company that in the 1920s and '30s surveyed and ultimately laid out the master plan for what became the suburban garden districts of Rodah Island, the southern part of Agouza, and all of Dokki. But in actual fact the above real estate development company was created by the Rodochanachi-Zervudachi scions back in 1908 when most of the land west of the Nile in the Cairo area was either state property or in the hands of the members of the Khedivial family. These were the real-estate boom years that saw the creation by various private real estate developers of Garden City, Heliopolis, Maadi and Zamalek. Thanks to the Giza & Rodah Co. the development of Agouza and Dokki would soon follow. However the result of mismanagement of funds and a notorious financial scandal, the Giza & Rodah Co. was forced into bankruptcy and by 1910 was put into receivership. Ultimately acquired by Oswald Finney and his associates the new owners decided to postpone development for almost a decade save for some limited construction most of it along the Nile. 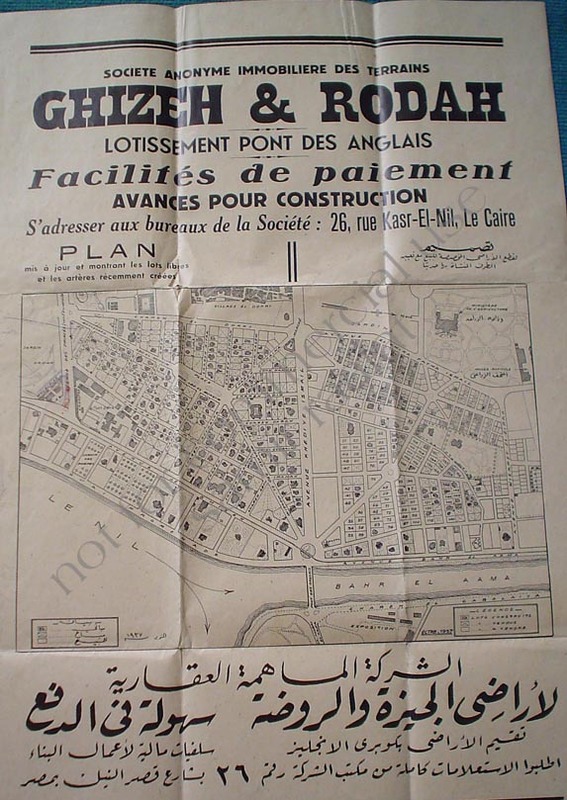 The bulk of Dokki's development commenced in the mid 1930s accompanied by an aggressive marketing campaign spearheaded by Tréhaki, Pilavachi & Co. acting as official real estate agents. Contemporary ads announced favorable installment payments, cheap financing and excellent mortgage terms. Since Finney owned the Société Orientale de Publicité many such promos appeared in his publications including Le Progres Egyptien, the Egyptian Gazette and La Bourse Egyptienne. Following his death in September 1942 it was his son who looked after the family business along with various company directorships. Another Finney legacy was the successful development of the soon-to-become fashionable suburb of Dokki. below: Pre-Finneyland in mid-1920s. Agouza Mosque marked in brown. To be noted that this particular piece of suburban development was labeled 'English Bridge layout' reference to the nearby Kobri al-Ingiliz. Moreover it was characterized by a set of predetermined boundaries. 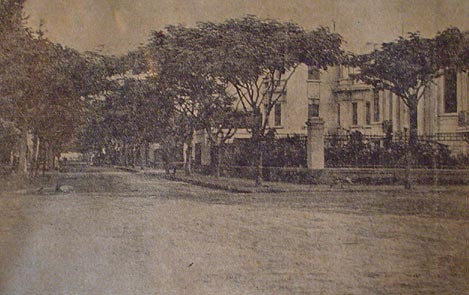 These were Avenue Khedive Ismail (now Tahrir Street) to the south; the curvy Abdel Rehim Sabry to the west; Avenue Wezaret al-Zira'a (Nawal) to the north; and Avenue Bahr al Aama a.k.a. Farouk al-Awwal Avenue (now Agouza Nile Corniche) to the east. Within these parameters is Finneyland, an oasis of grand mansions and charming villas with gardens. To begin with there were the palatial Nile-front homes of Chamseldine Abdelgafaar Pasha (purchased later by cabaret queen Madame Badia Masabni), Boulos Hanna Pasha (Cairo Far East Bank), Galal Ezzat Bey (Finnish Embassy) and Senator Abdel Aziz Radwan. Nearby but slightly removed from the Nile Corniche we find the remakrable house of Salem Hindawi (also spelt Hindaoui) Pasha whose first wife Khayreya Hanem was lady in waiting to Queen Nazli (the widowed Hindawi would later marry Hanifa Shafik). Dr. Hindawi's house is a vivid example of Islamic revival possibly inspired by the neo-Mamluk style Ministry of Awqaf headquarters on Gamea Sharkass Street where Hindawi occupied the post of medical director. From among Hindawi's more renown patients circa 1926 features Prince (later King) Seoud Ibn Abdelaziz of Saudi Arabia who at very early age suffered from eye disease which later make his distinctive dark glasses world famous. Further inland, fronting or close to Midan Finney we find the villas leased to or belonging to the Diwanis, Elouis, Hamamas, Hilmis and Sirrys next to the Argys, Bialobos, Bondis, Carmonas, Cicurels, Cohencas, Gattegnos, Hettenas, Molhos and Sullams. All belonged to the haute bourgeoisie and top-drawer merchant class. While the first group is composed of mainly white-collar Egyptian civil servants and technocrats, the second group represents a sample of the wealthier Sefardi families specialized in the retail, electric and small firearms trade. Their homes are today either foreign embassy residences or offices. Down Rue Finney past the Midan by the same name we find the house where Camelia (Liliane Cohen) lived neatly sandwiched between Villa Debbas overlooking the Midan and the three-floor Ciskovich building later acquired by Hag Agatti the renown silversmith. 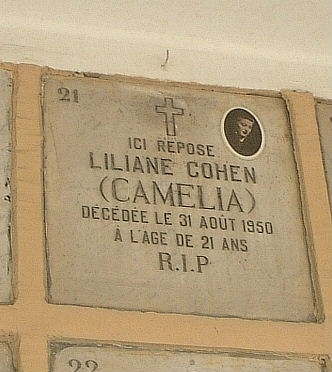 Camelia was King Farouk's favorite starlet before she died tragically in the TWA plane crash near Wadi Natrun. Fronting Rue Finney were the homes of several noted Greeks and Italians including Dr. Socrates Thomaides (Villa Roula) and Madame Grazia who gave dancing classes attended by her neighbors Poppy Papastephanou, Roula Thomaides and Alice Bondi along with the other neighborhood ladies. 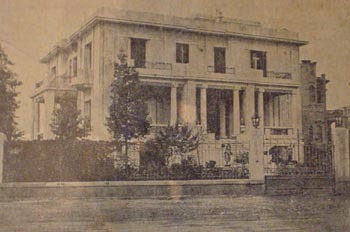 Right behind Villa Roula overlooking Abdel Rehim Sabry Street was the house of Nicola Kerestezoglu whose emporium at No. 11 Soliman Pasha sold the finest oriental carpets. Foremost among the prominent Egyptians residing in Finneyland when the entire area was still known as Bulak al-Dakrour was King Farouk's grandfather Abdel Rehim Sabry Pasha. 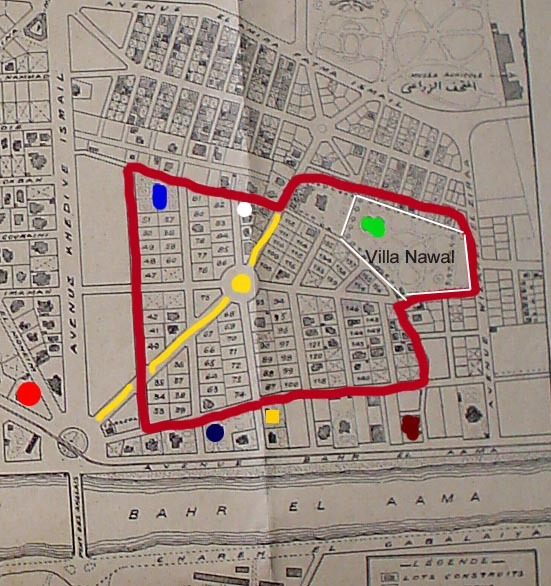 His vast property "Nawal" consisting of a mansion and a unique park extended along a large part of the street named after him. Stephan Papastephanou remembers how, as a young boy, he watched from the family balcony as the red and black Rolls Royce passed back and forth, from and to the nearby Sabry mansion which was separated from his own house by the beautiful Gategno residence. "Whenever Queen Nazli (the Queen Mother) was in residence many dignitaries visited her including the Shah of Iran when he was married to her daughter Princess Fawzia. A policeman was usually stationed at the corner of Finney and Abdel Rehim Sabry streets." Another VIP on Abdel Rehim Sabry Street for whom the policeman was equally attentive was Cairo governor Abdel Salaam al-Shazli Pasha residing at Villa Sakara. The other three other notables who lent their names to Finneyland streets were ophtalmologist Salem Hindawi, Boulos Hanna Pasha and Ismail Bey Aboul Fetouh. The ministry of culture is the present owner of the latter's villa. Meanwhile Abul Ezz Pasha acquired the nearby Villa Debbas. Other urban survivors include the handsome villa of Zakaria Mahraan Pasha purchased by Osman Abdelgafaar before it became home to Kuwait's ambassadors starting with Hamad al-Rujaib. On the other hand many villas didn't make it and were replaced by unsavory high-rises during the free-for-all 1970s and '80s. One of the first victims was No. 128 Farouk al-Awwal Avenue, the mansion designed by Italian architect Romollo Gilardini in the 1920s and which, during WW2, became a convalescent home for British soldiers courtesy of its munificent owner Abdel Aziz Radwan pasha. In return the pasha's sons were graciously welcomed in some of Britain's top schools. Thankfully, on Boulos Hanna Street West still stands a smoldering cluster of Finneyland's finest homes. Grandest among them is that other mansion designed by Gilardini in 1931 this time for Ali Sadek Bey. This wonderful piece of faux-renaissance with tennis court, fish grotto and the 30 orderlies needed to run it was subsequently purchased lock stock and barrel by mega-landowner Sayed Badrawi Pasha before becoming many years later the Wafd Party's dilapidated headquarters. Next to Sadek Bey's Italian folly stands the lesser palazzo of Upper Egypt millionaire Mohammed Sultan. With his wife Laure Menashe the debonair pasha entertained le-tout-post-WW2-Caire up until the 1952 coup put an end to it all. Today it is home to the South Korean Embassy. Also on Boulos Hanna West is the quaint home of exiled Moroccan chieftain Abdel Salaam Khatabi standing opposite the elegant immeuble de rapport (Villa Akmar No. 5) designed by Naoum Chebib of Cairo Tower fame for veteran Egyptologist Charles Kuentz (1895-1978). Nearby is the villa of Madame Labib Pasha Attia today the Algerian Embassy residence. Architects of some of Dokki's villas include Michel Liberman, Guido Carmona, Maurice Menashe, Albert Zananiri, Antoine S. Nahas and B. Manham. The last Finney to reside in Finneyland was Oswald's son Harold Edward. He left Egypt in 1956. All that remains of the Finney legacy in Dokki today is a small hospital by the same name "Finney Hospital" at No. 26 Abdel Rehim Sabry Pasha Street. Author of this piece would like to thank Stephen Papastephanou for sharing personal recollections of his old neighborhood. Dr. Salem Hindawi Pasha Street changed to Dr. Abdallah Kateb Street. Ismail Aboul Fetouh Street changed to Kuwait Street. 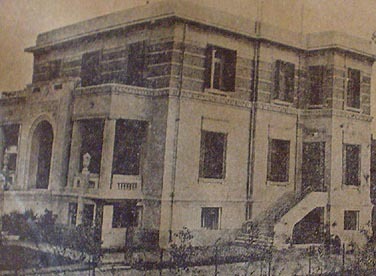 Mansion of Abdel Rehim Sabry Pasha confiscated by state and transformed into the Nasser Higher Military Academy. Villa Kerestezoglu No. 30 Abdel Rehim Sabry Pasha Street now headquarter of SEPEI Co.
Gategno House No. 36 Abdel Rehim Sabry Pasha Street now residence of Syrian ambassadors. Castle-type villa No. 114 Giza Corniche completely restored in 2004 by new owner businessman Aboul Enein. Twin George Zananiri (a.k.a. Messawer) Buildings No. 124 & 126 Giza Corniche still extant. Villa Guy Cicurel on Boulos Hanna Street West now residence of Dutch ambassadors. Regarding entomology of "Agouza" and mosque by the same name I hold over to Mahmoud Adel Sabit who has meticulously chronicled his family's history. (iv) mosque in Talla, Minoufia. Because of daily visits to her Giza opus during its construction in 1910, the workman dubbed it al-Agouza (old lady) Mosque in view of Nazli's advanced age. With the passage of time and the development of an urban landscape the quarter took the name of the mosque. 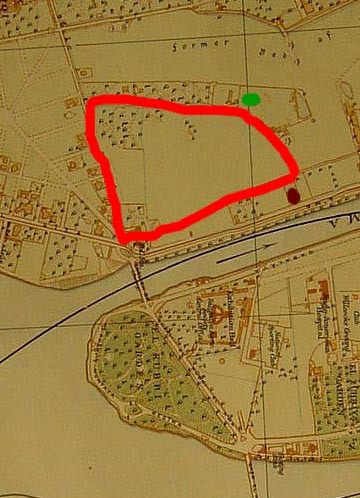 Moreover, the land where the mosque is located was once part of the estate of Mohamed Cherif al-Soghayar (junior). Upon the death of MOhammed, the only son of Cherif Pasha, his estate was divided up between his mother, his two sisters, and a couple of other relatives. His sister Tewfika was married to Abdel Rehim Sabry Pasha who built the palace 'Nawal' on her portion of the land. The name is attributed to Tewfika's departed daughter. Whereas the above mentioned mosque is known today as Masjid Al-Agouza it was originally called Masjid Nazli Cherif. A smaller mosque further north attached to the village of al-Agouza al Westania (westania = Middle) was called al-Agouza Mosque preceding the present one by several decades. 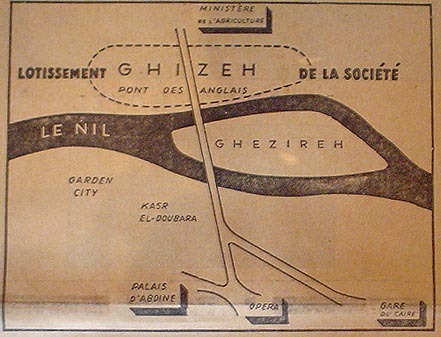 The village of al-Agouza al-Ganoubia (South) was located where the 6th of October Bridge reaches Giza. 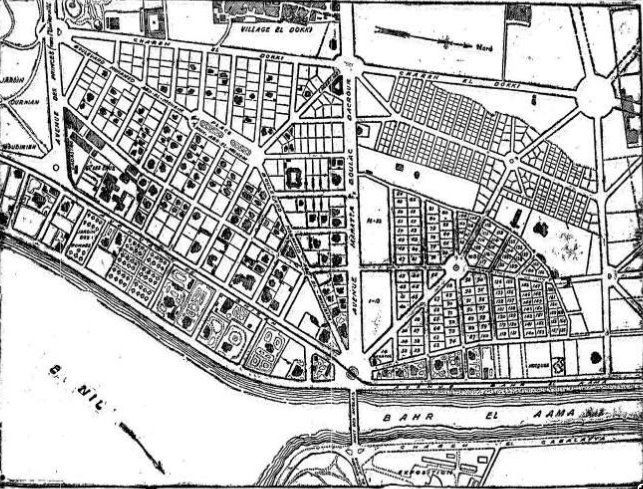 Both these villages did not exist when the Nile's western bank was located further west next to the Agricultural Museum. I was looking at Wikipedia's defintion of El Agouza which claims that the name only dates back to the early 1950s. I remember that the British Army Hospital there during the war was called colloquially the Agouza Hospital and I also remember when coming home from Gezira to our house in Giza at lunch time when the "English" bridge was open to let the feloukas through, my father telling my mother that we had had to detour and come home via Agouzeh. So I believe the dating was wrong. I therefore went to the fountain, to which I always go when I want to find out about 19th/20th century Egypt and I found your article on Finneyland. The red dot on the map is on the Villa Ralph Solomon Green, my grandfather. My uncle's villa and garden were immediately to the South, in the same block. To the South of his villa but still in the same block was unbuilt plot which belonged to all the Green brothers (sons of Solomon). Both these were taken over after his death and handed over to the Russian Embassy. Ralph's villa was pulled down. The family also owned another unbuilt plot on the other side of the main road, adjacent to Casino Badia, which was taken over and sold to the Sheraton Hotel for their carpark. Needless to say no compensation was ever received in respect of either of the unbuilt plots. The twin Zananiri Bldgs belonged to my grand-father Georges Zananiri, who gave one to each of his sons, one to my uncle Selim and one to dad (Albert Zananiri). He probably sold it to Mussawer (a relative) before we moved to 7 Hassan Sabry, and oncle Selim (father of Arianne Zananiri) to Lausanne. I was conceived and raised in one of those buildings until we moved to Hassan Sabry. Top floor, I remember a large terrace with trellis. Hello, Oswald appears in our family tree. I am trying to find his descendants to complete this branch of our tree. Your article is marvellous. I believe our Finneys came from Warrington as his grandfather James b: 1801 died there. Cheers, Ed. In the basement of the Bondi villa was an "abri" shelter built in concrete for protection in case of a raid, or bombing by the Germans during WW2. Mr. Molho or Carmona, were the wardens who used to go around the neighborhood, during the alarm to make sure that all the curtains were shut so that no light could be seen from the German airplanes. I remember two or three episodes when we had to go to the shelter when the siren would sound, all sitting in the dark. Molho had a whistle and a flashlight, and would use it if he could see any light from houses from the street, and I still remember the sound of his whistle in the middle of the night. All houses were equipped with heavy curtains for the purpose. Most if not all of the houses in the neighborhood were designed by Carmona who used multi level areas the prime example being Bondi' s Villa, where the Family Room was located between the Salon and dining room, and the bedrooms in the second floor (sort of an intermediate level). Another wonderful example is the Carmona-Molho duplex, which was multilevel, and very interesting in design. I believe that the dwelling still exists. Carmona used to design and use rounded doors very difficult and expensive to build in our days. Our own villa was smaller and I remember very well that my Bluethner piano was in an elevated part of the living room, and when I was a kid, I used to pretend that I was giving recitals. I still have that piano here in my Baltimore (USA) basement.